High-energy supplement for athletes of all disciplines alloy. The product is based on high-quality complex carbohydrates and minerals - so important during exercise. 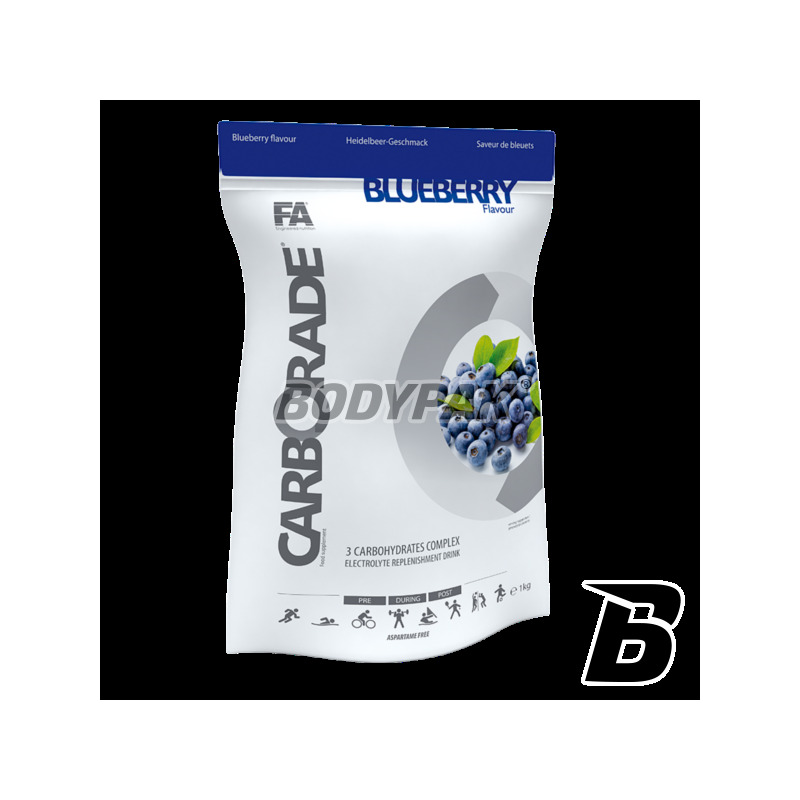 FA Nutrition Carborade® to supplement energy for athletes of all sports created from complex carbohydrates with added minerals essential for physical exertion. Carbohydrates are the primary source of energy for the human body, and especially the athlete. They differ among themselves chain lengths and varying glycemic index. They are divided into simple carbohydrates (glucose, fructose, dextrose), which provide energy immediately and significantly affect insulin burst - very strong anabolic hormone. Complex carbohydrates (maltodextrin) are released gradually and continuously because they are very stable source of energy for the body of the athlete. Carborade® carbohydrates recommended for athletes burdened with significant physical: sports endurance athletes (boxing, martial arts), weight training (bodybuilding, powerlifting) and endurance (cycling, running, swimming, team games). Carborade® is enriched with a sufficient amount of minerals (sodium, potassium, phosphorus, calcium and magnesium), which provided the exercise effectively supplement lost electrolytes and are responsible for proper muscle contraction. 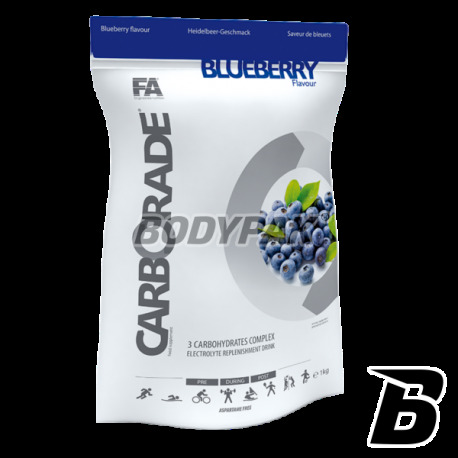 The use of Carborade® in the period before training maintains normal blood glucose levels, which delays fatigue, effectively reduces fatigue and exhaustion intense exercise. As a result, it helps you overcome crises during intense and prolonged exercise. Składniki: maltodekstryna, regulator kwasowości (kwas cytrynowy), aromat, barwnik(i) (E1411, E1712, E1043,4,5,6,7*, E160a5,7, E1639,10, E13211), koncentrat soku buraczanego8, substancja słodząca (sukraloza). *E104 - może mieć szkodliwy wpływ na aktywność i skupienie uwagi u dzieci). Dotyczy produktu o smaku: 1Zielone jabłuszko, 2Grejpfrutowy, 3Cytrynowy, 4Limetkowy, 5Mango, 6Melonowy, 7Pomarańczowy, 8Truskawkowy, 9Arbuzowy, 10Winogronowy, 11Jagodowy. Jak dla mnie produkt godny uwagi, choć ten konkretny smak jest taki sobie. Dobre carbo,ale nie robi żadnej rewelacji. Smak winogrono pyszny, natomiast arbuz to jedna wielka porażka.Mdli od samego zapachu. Dobre carbo, ale nic ponad to. Smak (cytryna) zajefajny, rozpuszczalność idealna, ale w końcu to carbo :). Cenowo przyzwoicie.. sięgam kiedy potrzebuję. Dobre carbo, ale faktycznie zbyt słodkie, aż mdli..
jak dla mnie strasznie słodkie , nie chodzi mi o smak, tylko o zawartość cukru.